Does anyone know Md3 repository sites or etc? "converting stuff to md3 with Blender just wont display ingame." Like a site that has lots of MD3 stuff. I'm mainly looking for plants models etc. I tried downloading other version, converting obj to md3 with blender v 2.7s but they wont show in Duke. the def doesn't give any error, is like the sprite is invisible. There was that Black Rayne Studios site with tons of models. Unfortunately the site is down for quiet some time now. I recently found some Russian RTCW forums where many models converted to md3 where posted (mainly WW2 vehicles but also a lot of plants and stuff). I can´t remember the name right now, but I can look for it tomorrow. I know I downloaded neaarly everything from that sites. If you can wait until monday/tuesday, I can upload everything I can find on my HDD somewhere. I don't use Blender but I know certain versions of it have a fussy exporter for md3. It might have something to do with checking a box or button to save UVs when exporting. Someone who runs Blender should know. Finding models in md3 is getting harder every year. There is a program called Noesis that is easy to use and does a good job most of the time in converting model formats. Ill check the Noesis thing. Yeah, Npherno ( MD3Compile ) will work if the original model is in OBJ format which is very common. Also was wondering why the Duke grp file was like over 333mb. is actually a mod, looks damn nice etc. the stuff inside the md3-models are free to be used for other mods etc? Those models are from a Return to Castle Wolfenstein modding forum. I don´t think that anybody cares if they get used in other mods. problem is leaves has one side , other side doesn't exist. leaf has only 1 side. Whoever made that model goofed up. See if this looks any better. All the leaves planes of the model were visible from the inside. I flipped them to be visible from the outside. I also combined the 11 leaves groups into one so all you need in the defs is surface 0 and 1.You can convert the tga to png for a way smaller file size too. Change the frame name to none00. That is the default name my program uses. Leaf still shows 1 sided. The merged 12 into 1 works. 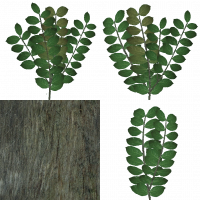 Changing the tga into png will make green surrounding around the leaf. When I saved tga to png, adobe gave a warning (thing not completely saved and asks to save yes or no etc. So probably around leaf May have to manually crop the green into transparency. try this png. In converting there should be a transparency option to checkmark or adjust. A lot of trees are made with one sided planes because the leaves are all above the player so you don't notice they are one sided. Since yours are so small you notice it. Was a solution ever found for this? I'm having the exact same issue; ie custom blender models that I export to .md3 don't show up in-game... however other .md3s (not made by me) work fine..
For future reference, there is Sitter's site: http://www.md2.sitte...s.nl/models.htm MD2 rather than MD3, but for static objects, it shouldn't be a problem. Post the MD3, blend and the def file and we'll have a look. The most common mistake is that the frame names of your model don't match up with what your def file says they should be. Thanks for offering to take a look, however when I try to attach my .blend file to this post I get an error message "You aren't permitted to upload this kind of file"
Can I send the files to your email address? You can zip them. You can send them to my email, but then Mark won't be able to see them.